I'm loving this mild January weather. It has allowed me to wear clothing that would otherwise be inappropriate for a typical Winter day. This is also the debut of my new Michael Kors Jet Set Travel Tote in Tangerine (which seems to be the it colour this year). This bag was a little bit of an impulse buy. Last week, I went into Holt Renfrew to pick up the Prada tote in Papaya, which I reserved a few months ago. If you watch my videos (Link! ), you know that I had originally purchased the black version but then saw a promo picture of the Papaya colour and fell in love. However, when I saw the bag in person, I wasn't as wowed as I thought it would be :(. So, I decided to forgo it and I went back to my original choice. On my way out, I saw this MK tote. The colour is exactly the same as the Prada and it's the exact same Saffiano leather. For some reason, I was much more drawn to the orange hue on this bag than the Prada. The shape reminds me a lot of the Neverfull. It's the perfect colour and design for Spring/Summer. Are you loving this year's it colour? I love the bag and colour! I thought you went ahead and exchanged for the Prada tote in Papaya from your youtube video but this one is just as good! Please let me know what you think as i'm still learning! I am loving the warm January weather, too! I was wearing sandals the other day in Colorado. Ridiculous! 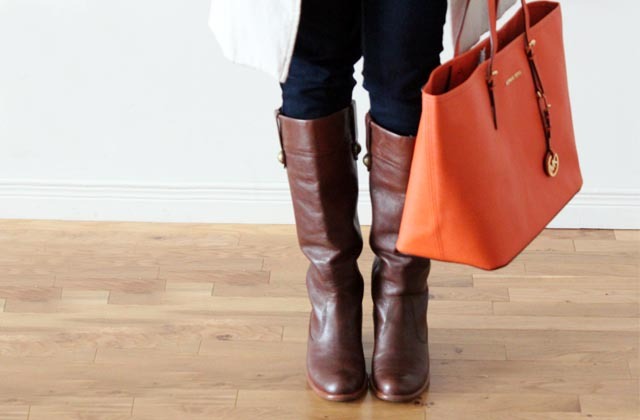 Your orange MK bag is so gorgeous. It's such a great size and shape, and the color is the perfect shade of tangerine. Love it and totally want one now. 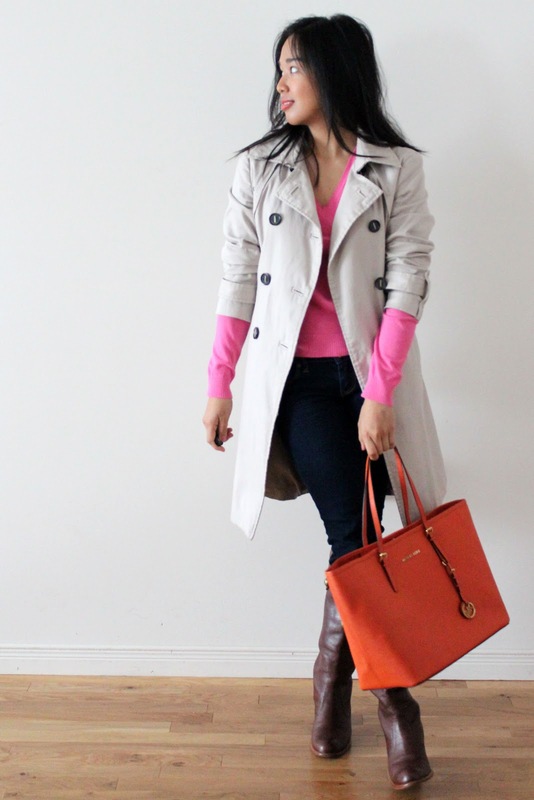 Loving this whole look and the fact the MK tote gives it a pop!! A bag that is a must NEED in my collection yo!! Will you do a video review of this bag please? I am lovin it too. Neverfull GM, move over!